Registration is now open for Calling 101 on Saturday, December 2! This class, taught by Dugan Murphy, is designed for experienced contra dancers with absolutely no experience calling contra dances. Whether you want to call dances yourself or just get a more rounded understanding of the contra dance experience, this class may be for you. Click here to read more and to register. Class size is limited to 9 participants, so register soon! New PICD Open Band - YOU’RE invited! Have you ever wondered how it feels to make that toe-tapping hollering music you hear every Thursday night? Here’s your chance to get involved. And for those folks wanting a little preparation, we will have a practice party to get ready the week before, time TBA. So are you in? If so, please email Emily at etroll@wesleyan.edu for more information. If you're curious about what's been happening here in Portland, or what the class entails, the latest edition of the Country Dance & Song Society's quarterly News publication featured an article Dugan wrote describing Calling 101 in detail (full PDF). You can also check out his website for more resources. Elsa Rowe practicing at a Calling 101 class. What's next? As these folks develop, you'll see them booked for full nights in Portland and, we're sure, in other venues in Maine and beyond. To offer further support, this Fall Dugan is hosting a Calling 102 session for developing callers and he's designing a Calling 103 to be held next year. The PICD community has been so welcoming and supportive as these individuals learn. Thanks for your rumbling applause and many warm pats on the back! PICD is officially a 1-year old! And who do we have to thank for so much of this goodness that's been growing? Soooo many people contributed to creating PICD in the last year that we almost ran out of space to write names! If you've given your time, talent, energy, space, resources, joy, verve, or your everything to PICD, we thank you from the bottom of our hearts. As for *next* year, PICD is looking forward to bringing to life some community desires, including beginning to plan a dance weekend (yes! you heard that right! ), as well as offering more monthly opportunities to dance creatively by learning style tips, flourishes, and advanced choreography. We'll keep cultivating new and emerging callers, and we might even kick off opportunities to host open band nights. If you have ideas about what would make our second year great, or if you want to volunteer, get in touch with Dela at dela@portlandintowncontradance.com. Free dances for regulars and walk-bys. Thanks to a super collaboration with Friends of Congress Square Park, PICD will be offering free outdoor dances third Wednesdays June through September 2017! All dancing will be from 6 til 8 PM in Congress Square Park, located on the corners of Congress and High Streets downtown. Our first show will be part of Make Music Portland, an annual celebration of sound that takes place on the first day of Summer every year in our city and cities around the world. Walk around from 10 AM til 8 PM this Wednesday and you'll encounter hundreds of free performances on the streets of the city, raising the music of tons of genres. Dugan Murphy will teach each of this evening's dances; he's known for emanating joy and for teaching with the artful precision of clockwork. He's joined by Maivish, playing tunes from British Isles, Ireland and America with a mix of original compositions. With Jaige Trudel on fiddle, Adam Broome on guitar and Matthew Olwell on flutes, bodhrán, and percussive dance, their performances are infused with lush vocal harmonies, inspired interplay, and captivating spirit. Maggie Robinson will teach each of this evening's dances in her casual and warm style. She's joined by a trio comprised of Greg Boardman on fiddle, Neil Pearlman on piano and mandolin, and Hadith Bani-Adam on Somali Oud. Surprising influences result in a delightful musical mix of culture, tradition, and innovation. Dela Taylor will teach each of this evening's dances, bringing her humor, and fresh, light calling style. She'll be joined by Volution, a dynamic band that deftly moves from tunes with energy and zest to those with room and gravitas. Adams Carney is on fiddle and sometimes accordion, Helen Newell is on another fiddle, and Nolan Rogers is on cello, playing both tunes that hold places of honor in the New England folk tradition and tunes inspired by European links. Dugan Murphy is back for the final dance. He's joined by a trio comprised of Bethany Waickman on guitar, Dave Langford on fiddle, and Glen Loper on mandolin and tenor banjo. All three musicians are mainstays on the national contra dance circuit, combining in countless foot-stomping, electric collaborations inspired by traditional music from Ireland, England, the Balkans, and New England. A sound system is in the works. On Saturday, March 4, over a hundred dancers navigated the bitter cold to warm the hall of State Street Church. These giving, lively folks came to help raise the final $1,300 needed to fund a sound system for Portland Intown Contra Dance. Alex Hennings started the evening with a waltz workshop, with music provided by Emily Troll of Anadama, and Jamie Oshima of Barefoot. Dancers both experienced and novice moved their feet to the beat and became familiar with the basics. Barefoot, the duo of Ed Howe and Jamie Oshima, opened the contra dance with a few waltzes and then, collaborating with Dugan Murphy as caller, created an exceptional evening of dance - an evening that had the buzz of magic. All of these performers generously volunteered their time and energy to help make this happen. They, with the dancers, were coming together to support a dream. Right now, Sound of Perfection, Ed Howe's high quality sound business, is working on the system. And PICD's carpenter, Dan Brodhead, is working on housing for the system. We should have it within the next few weeks. Why does it matter? It means our sound technicians, like Glen Loper, Jamie Oshima, and Ness Smith-Savedoff, won't have to lug equipment in every week. And it means that we won't have to invest in renting a system, which means that more money goes to performers every night. A tremendous thank you to everyone who had a part in making this happen - by giving, volunteering, and spreading the word. You're a buncha generous folks! We hosted a fundraiser at the end of 2016 to raise $5,000 to fund a house sound system and fund upcoming 2017 costs. Meeting this goal would mean not only higher-quality, more reliable sound, but also mean that more of the admissions money raised each dance can go directly to the performers, who deserve it and whom we want to keep visiting us again and again. Well, we learned that you're awfully wonderful, sharing, generous people. You helped us raise $3,040 of our $5,000 goal! Just over 60%. Wahooooo! After accounting for the cost of fees, thank-you gifts, and other things, we're still short about $1,500 for a sound system. We're working on how we'll raise this money in the coming months, and this might look like special dances or something else. You'll find out soon! If you're inclined to donate a bit extra to help us make up the gap, please do! In the coming week, we'll be printing t-shirts, cards, and other thank-yous, Dugan will be writing thank-you dances, and we'll be sending letters so you can do your taxes. ;) If you're expecting a thank-you gift, you'll receive it by the end of January 2017. We're sooo grateful for everybody who made something neat to offer, who shared the word, and who gave. & a few anonymous folks. THIS SERIES IS FUNDED IN PART BY A GRANT FROM THE MAINE ARTS COMMISSION. 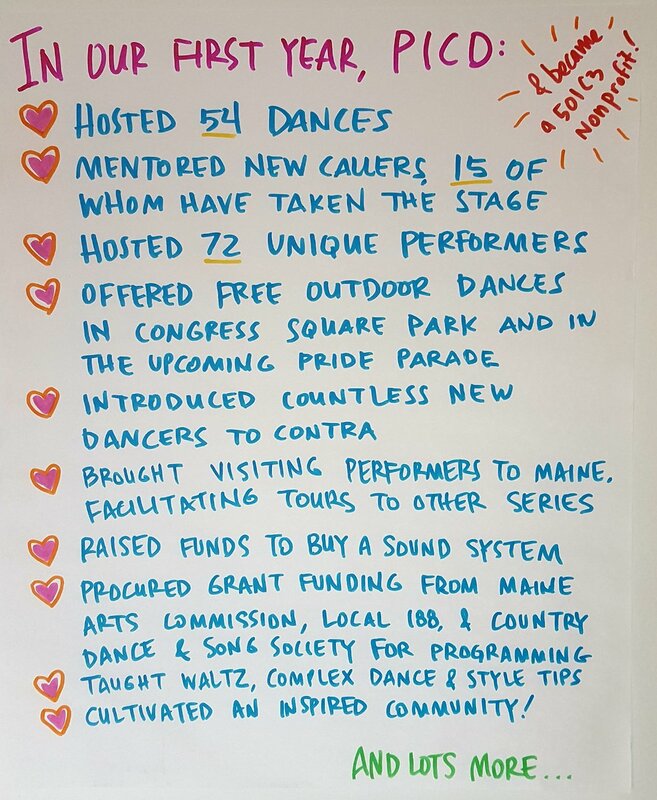 Portland Intown Contra Dance is really proud and happy to have been selected by the Maine Arts Commission for a project grant to help us expand the already awesome emerging caller and musician mentoring program we've been spear-heading for the past several months. Our buddies at the DownEast Friends of the Folk Arts are partnering with us to help this happen. We’re feeling successful already and this infusion of funds will further support this important program. PICD is seeing an average of twenty new dancers every Thursday evening at our weekly dance, individuals who are quickly turning into regular dancers. Scores of experienced, yet latent, local dancers have re-entered the scene and feel enlivened by the local dance. Additionally, barrels of dancers from New Hampshire and Massachusetts are discovering the Maine scene, seeing Portland as a gateway to experiencing traditional dance in the state. In this environment, ten student callers have already taken the stage and are currently under the tutelage of a Nationally-acclaimed caller, Dugan Murphy. Ongoing feedback from these individuals tells us that they’re feeling well-trained, confident, excited to be engaged in this art, and inspired to continue calling. Another twenty-or-so callers have been trained in a classroom environment, gaining hands-on experience through peer-to-peer classroom teaching. Mentee Caller Jeannine Ameduri calls at PICD July 14, 2016. Photo by Dela Taylor. Our next steps are to continue the work with caller mentees and expand the program to include emerging contra dance musicians, who will receive training in the last quarter of 2016 and take the stage as 2017 begins. If you are not already familiar with the Maine Arts Commission, I encourage you to visit their website or contact the executive director of the agency, Julie Richard. They are a dynamic state agency supporting Maine arts and culture through their grants and services. What difference does this program make? Traditional music and dance arts have been integral New England cultural practices since the late 17th century and we’re now glad to be passing on these practices to new, modern audiences. As our dancers know, contra dance is an intergenerational, cross-sectional social dance that enables just about anyone to connect to a loving, safe, enlivening community. People find confidence through dancing. They find friends who support them throughout their lives. They find safety, wellbeing and respect in a substance-free environment. And we pass a rich history on through the generations. We couldn’t be happier. We extend a hearty thanks to everyone involved with PICD. You're a part of our mission to enrich lives and cultivate a vibrant community through dance. The traditions we love so much are spreading!